Despite adhering to rigid Standards and Practice regulations, An Early Frost still resonates, thanks in large part to an intelligent script, committed performances and filmmakers who knew they an important story to tell. In the '70s and early '80s, issues of social importance were frequently visible on the small screen. Renowned for their frank subject matter, cheesy production values, and lurid storylines, TV movies attracted millions of viewers with compelling, ripped-from-the-headlines stories. Their controversial subjects included bulimia (The Best Little Girl in the World, 1972), nuclear holocaust (The Day After, 1983), teen prostitution (Dawn: Portrait of A Teen Runaway, 1976), and spousal abuse (The Burning Bed, 1984). By 1985, nearly 2500 Americans, the majority of them gay men and intravenous drug users, had died from AIDS, but a lack of medical knowledge, government indifference, and homophobia kept this new disease on the back pages. It was still deemed "the gay cancer" when Rock Hudson died of AIDS-related illness that same year. 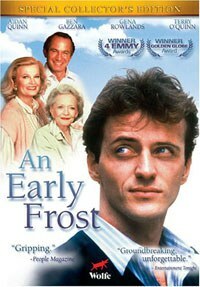 An Early Frost, airing in 1985 and just released on DVD by Wolfe, pushed AIDS into the living rooms of a squeamish middle America. Written by Ron Cowen and Daniel Lipman, who would go on to create Queer as Folk, the film was uncompromising and urgent. Predating the theatrical releases A Longtime Companion (1990) and Philadelphia (1993), the Emmy-winning script emphasized the disease's emotional and social tolls. The focus of these tolls is Michael Pierson (Aidan Quinn), a Chicago lawyer who lives an upwardly mobile life with his partner Peter (D.W. Moffett), an antiques restorer. When he shows the first signs of AIDS, Michael must not only tell his family he is gay, but also that he is dying. His disclosure strains relationships with his tight-knit family, who struggle to understand and accept a dying son who has become a stranger to them. Despite adhering to rigid Standards and Practice regulations, An Early Frost still resonates, thanks in large part to an intelligent script, committed performances and filmmakers who knew they an important story to tell. "It was hard not to make it another disease-of-the-week movie," Cowen remembers on the DVD's commentary track. "There was all this information people didn't know at all. They had to be told this. And we had to tell it in a dramatic structure and keep it 'human.'" The screenplay is peppered with medical knowledge about AIDS known at the time. While this makes the film seem at times like a long public service spot, its estimated 33 million viewers were informed about AIDS by its end. Some of this information is conveyed in explicit representations of the disease's ravages. Michael contracts pneumonia, then toxoplasmosis, a brain parasite that forces the body into fierce, violent convulsions. A harrowing hospital support group scene leaves Michael shocked by the advanced stages displayed by the other group members, including skin blotches, hand tremors, blindness, and emaciation. Beyond their physical conditions, they reveal fear, anger, hopelessness, and self-loathing. Flamboyant Victor's (John Glover) nonstop wisecracking barely masks his desperation and sadness, but he remains entertainingly stubborn. Even as he lies dying, Victor proclaims, "I'm hanging in there until they find a cure." Bold to show such emotional and physical difficulties, An Early Frost affected a range of viewers. "I remember it as it was right smack in the worst of the pandemic," Jim Hyde, an AIDS activist who has lived with the disease for 25 years, recently told AfterElton.com's Josh Aterovis. "I felt the film on a visceral level. In some way, I felt validated as a human being in the public eye, perhaps for the first time since being infected." The film achieved this effect in part by its use of melodramatic conventions, familiar emotional cues that didn't threatened network TV viewers. "It's not really a story about AIDS," Lipman says in commentary. "It's about family relationships. It's the emotional relationships that keep the movie fresh and powerful." Even Cowen and Lipman are surprised that it remains topical. "I thought 21 years later this film would be archaic because everything would someday be solved," Cowen said. "But it just isn't. It's unfortunately relevant." At least part of this relevance lies in its refusal to fall back on easy resolutions. At film's end, Michael prepares to leave his family and return to Peter in Chicago: as thunder rumbles in the background, he and his parents solemnly say their goodbyes, knowing they may never see each other again. Still, they hope for a cure. The doctors in An Early Frost admit that sometimes that's all they can give to their patients. Sadly, 25 years later, we're still looking for that cure.